Travel off the beaten track and experience an authentic and private safari in the middle of nature. 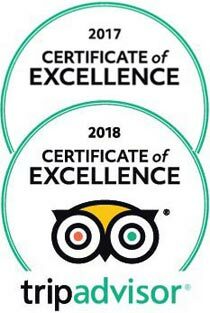 On our mobile safaris, nature lovers disconnect from the rest of the world and reconnect with nature, while exploring Tanzania’s national parks on exciting game drives. On special private campsites you will get away from it all, it’s just you and the bush – the only neighbours you will hear are lions roaring and hyenas calling through the night. 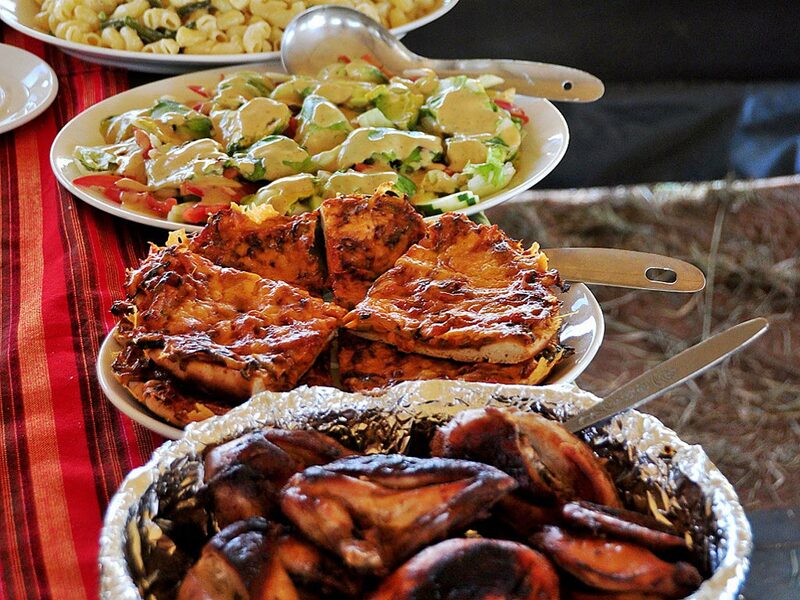 No worries, we’ll make sure you get a cold drink and a delicious meal, even in the middle of nowhere. 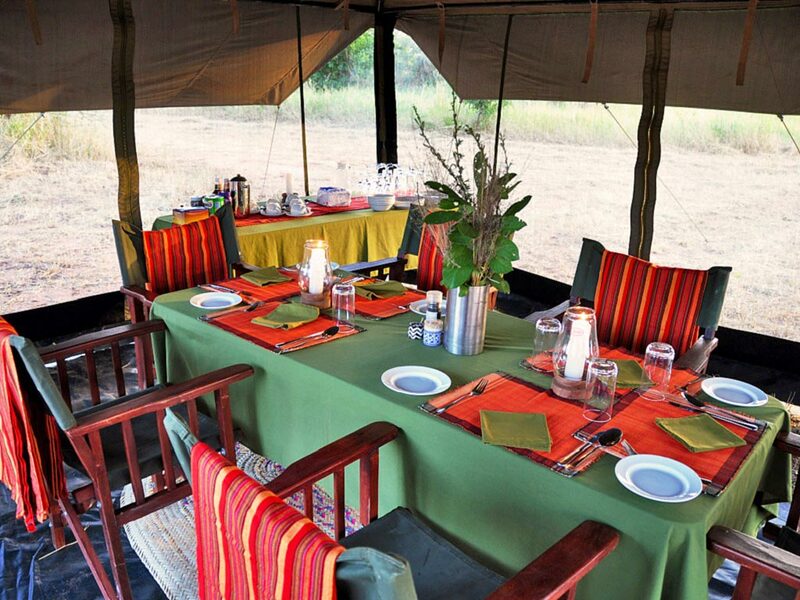 Experience the true meaning of safari at our Mobile Explorer Camp. We have recently changed our logo. In our videos, you will see our old logo, the African continent and red elephant. Our Mobile Explorer Camp stops at private special campsites within the national parks. There are no permanent structures, giving you an undisturbed experience of the wild African nature. Our team will bring all equipment and supplies they need to make you feel comfortable. The campsites are not fenced and at night, animals may roam through camp. The only thing that separates you from nature is the canvas of your tent. Arriving at your Mobile Explorer Camp after an adventurous day of game viewing, you are welcomed by your camp crew who has already set up the camp. Tents will be pitched, beds will be made, furniture will be set up and your chef will be occupied in his bush kitchen preparing dinner. You have time to settle in and wash off the dust from the day’s adventures. Let your camp crew know when you are ready for a refreshing shower and they will fill up your bucket shower with hot water. Gather around the campfire for some snacks and cold drinks and enjoy the romantic atmosphere. 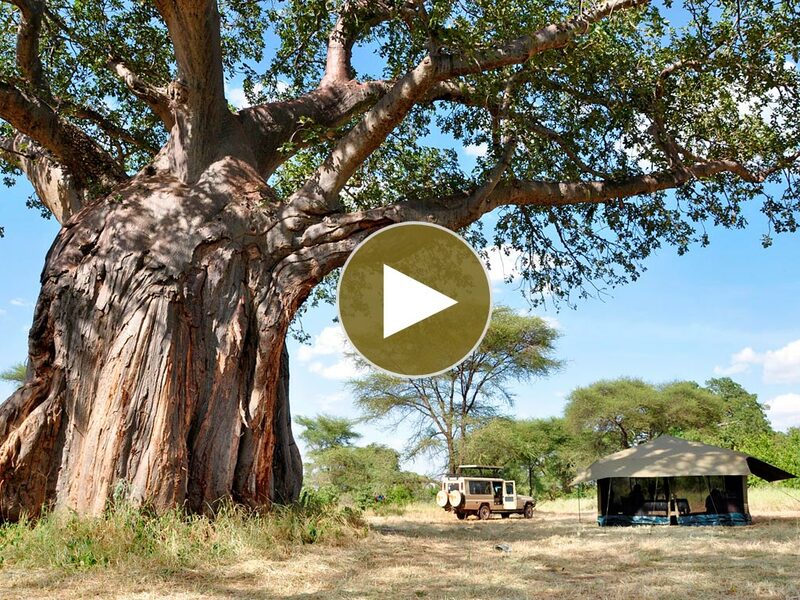 Recall the experiences and highlights of the day, relax and absorb the smells and sounds of the Tanzanian wilderness. Dinner will be served in the mess tent or under the open African sky while thousands of sparkling stars appear above you. When you succumb to sleep, you will be lulled by the sounds of hyenas and lions calling through the night. 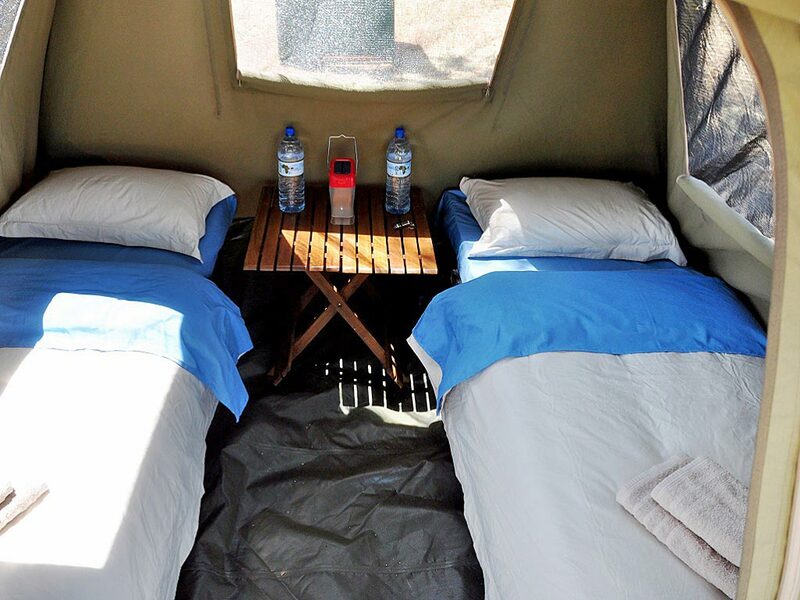 We will make sure you are comfortable and well taken care of during your time in the bush: you will be accommodated in spacious dome tents (3 m x 3 m and 2.1 m high) with proper beds, comfortable mattresses and linen. Further equipment includes bedside tables, solar lamps and towels. Outside your tent, director-style camp chairs and a side table are the perfect spot for relaxing and unwinding. 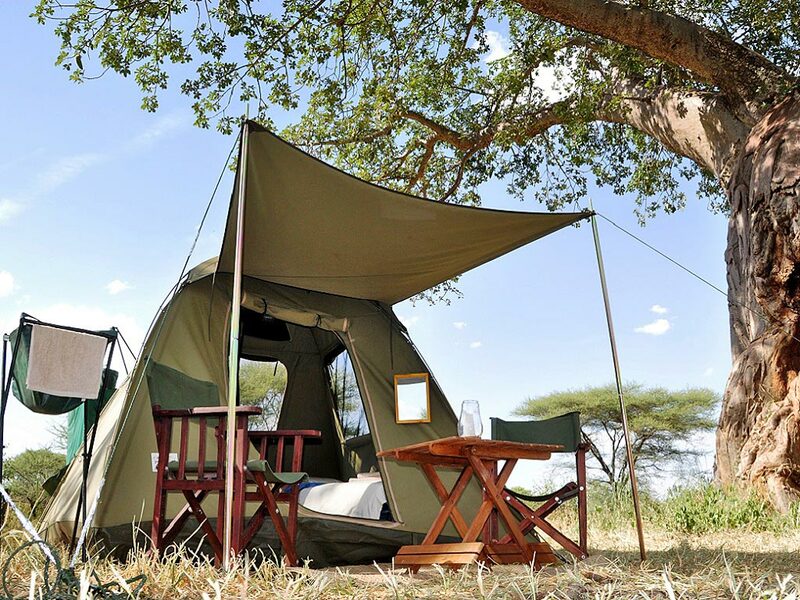 Each tent is equipped with a washing tripod and the camp has a bush toilet and bucket shower. The luxury of our Mobile Explorer Camp is being alone in the bush with no other tourists around. Your only neighbours will be wild animals roaming these remote areas. 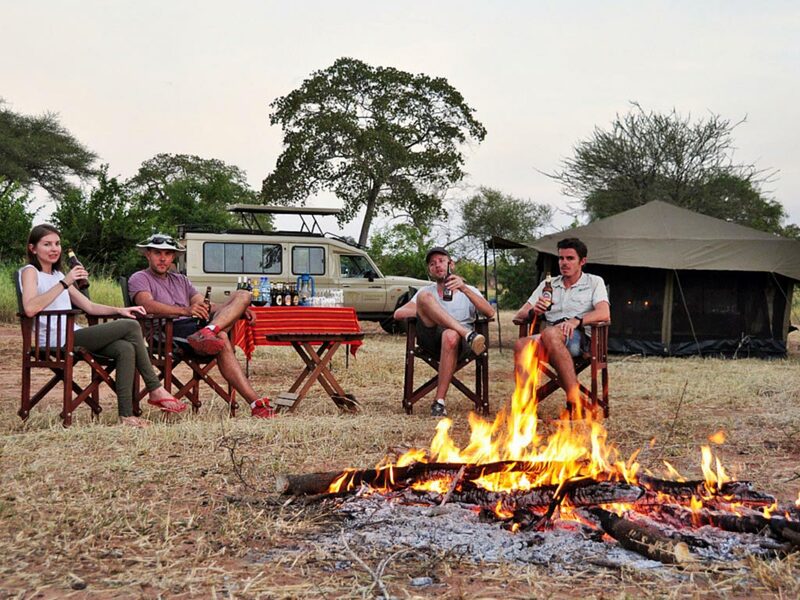 The mobile safari is a private safari and you only travel with people you know and love. It’s the perfect opportunity to reconnect with your family, bond again with a group of friends or to have a quiet and private time away with your partner. With our Mobile Explorer Camp and its complete flexibility, anything is possible. Combine a few days in remote and wild areas with an extended stay at a luxury lodge or end your lodge safari with the Mobile Explorer Camp as a highlight. Depending on the season, we can set up our Mobile Explorer Camp near the big herds of wildebeest and zebras for you to experience the Great Migration. 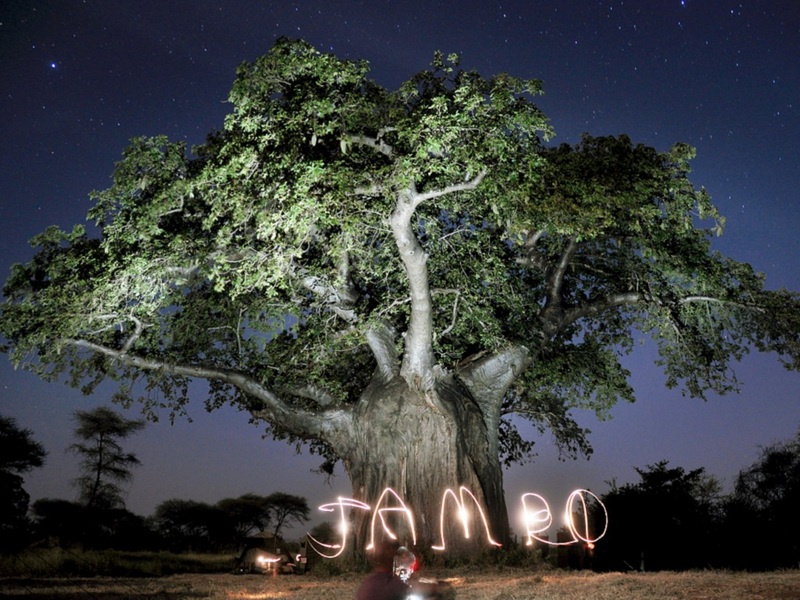 Join us on a mobile safari and immerse yourself in Tanzania’s wilderness!